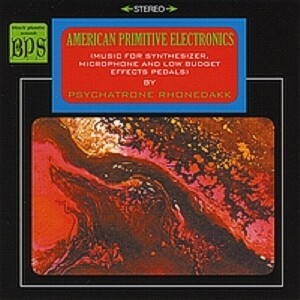 Psychatrone Rhonedakk - "American Primitive Electronics"
The subtitle of the latest offering from Scranton, Pennsylvania's electronics wizard is "Music For Synthesizer, Microphone, and Low Budget Effects Pedals", which certainly gives you a hint at what you'll be hearing. But only a hint.Collected together here for the first time is a series of tracks from Psychatrone's early days, some dating back as early as 1998 (as such, this is a Psychatrone Rhonedakk 10th anniversary celebration disc), culled from cassette releases and some from even more mysterious sources. The sounds here deliberately hearken back to the early days of popular electronic music in the late 60's and very early 70's. Artists like T.O.N.T.O. 's Expanding Head Band and Beaver & Krause are touchstones that no doubt served as inspiration in the creation of this music, but I also hear (perhaps less intentionally), dashes of Syrinx (one of the first rock bands to use the synthesizer as the predominate lead instrument) and even Nash the Slash. Still, it's all wrapped up in Psychatrone's own unique approach, whether it be the hypnotic experimental bits like Dwarf Loop Extract 1 and Vibraloop or the lengthy odysseys like the nearly 20-minute SPACE or the 14-minute long Tangerine Nightmare. The latter of these is surely the highlight of the album for me, an extended trip into dark, psychedelic realms featuring both Psychatrone's freaked out electronics and the guitar work of Brian Langan of The Swims. Also included are two recent tracks that bookend the album. The opening cut, Cult of the Violet Ray, is a track recorded during the Disturbs the Air sessions that didn't make it onto that album, and is a piece of dreamy, yet disturbing psychedelic balladry. Closing the album is a brand new cover of the Velvet Underground tune I'm Set Free, a bright, pulsing tune that is a wonderful contrast to some of the darker tracks on the album. What always strikes me about Psychatrone Rhonedakk's music is no matter how experimental and eccentric it gets, it always remains highly listenable, and the early recordings on American Primitive Electronics are no exception. This album is a joy to listen to, from its oddball start to its subtly uplifting finish.